So if you’ve owned or been looking to purchase a nice hydration system you’ve seen that there is now Gen2 systems from WaterBoy Sports. So what’s the difference? There are significant improvements that have been made to the WaterBoy HPMT-G2 that makes it much superior to the original HPMT. The main difference is with the wagon. The G2 wagon is now all aluminum with solid rubber casters and does not utilize an axle and does not have an undercarriage. The aluminum wagon is much more durable, no longer has any moving components in the undercarriage that will break, the tires will not go flat and are able to tow the weight of the that 55 gallon tank with water. Also, the aluminum wagon is open on the bottom with only a lip that allows the tank to sit on it so that the water can fully drain out. The aluminum wagon also has a hitch that allows it to easily attach to a gator. The 55 gallon tank is an all drain tank with a sump to prevent any water collecting and sitting at the bottom of the tank. It has a bigger 10″ lid for easier filling of ice and water. The G2 now has 8 drinking stations and are better distributed on either side of wagon (4 on each side) to allow easier player access on both sides of the unit. The power pac is also better with a much bigger and more durable water pump as well as a more durable rocker switch. That is a ton of great improvements. So if you already have a unit maybe you should consider upgrading if you don’t have one yet now is the time to buy. 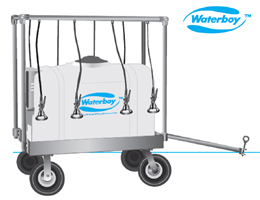 Buy a WaterBoy HPMT-G2 today and beat the summer rush.